After a hiatus of almost three weeks, Arsenal were back in action against Stoke City for their 31st Premier League fixture of the season on Sunday. They hosted the Potters at the Emirates Stadium and churned out a 3-0 victory. 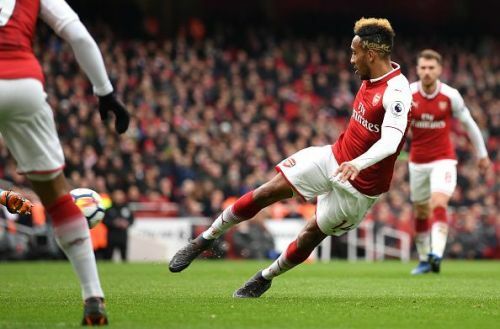 Pierre-Emerick Aubameyang and Alexandre Lacazette scored the three goals to help them gain three points and retain their sixth position on the points table. Stoke City, on the other hand, are now facing relegation, perched in the 19th spot, and will need to step up their game in the remainder of their fixtures to avoid tumbling into the Championship. The centre-forward now has 5 goals in 6 matches for the Gunners and is looking like a good buy for them already. Against Stoke City, he failed to get proper service from his teammates in the first 70 minutes of the game. He made some good runs through the middle but was often left on his own. However, as soon as he moved into a wider position, he started stretching the opposition's defence. The arrival of Alexandre Lacazette was what made this happen and the subsequent result is likely to encourage Arsene Wenger to consider playing the two strikers together. Aubameyang’s first goal of the night came from the penalty spot in the 75th minute of the match. It was awarded to the Gunners after Mesut Ozil was brought down in the Stoke box by Bruno Martins Indi. Aubameyang completed his brace off a ricocheted corner in the 86th minute. It was a clinical finish from the former Borussia Dortmund player, who stretched his body beautifully to get to the swivelling ball and power it into the corner of the net yet again.